⚓ T209016 Is it correct to show RTL content in RTL display mode alongside LTR content in LTR display mode? Is it correct to show RTL content in RTL display mode alongside LTR content in LTR display mode? Ramsey-WMF moved this task from Untriaged to Triaged on the Multimedia board. Ramsey-WMF moved this task from To Do to Design Consultation on the Multimedia-Team-Working-Board board. Ramsey-WMF added subscribers: Jdforrester-WMF, Cparle. You sure we want to change that? From my own perspective I'd probably prefer English to be left-justified on an RTL page. @Amire80 any thoughts on this? Amire80 added subscribers: Mooeypoo, Huji, eranroz, Pginer-WMF. My TLDR: It's OK to align each language according to its direction in this context. 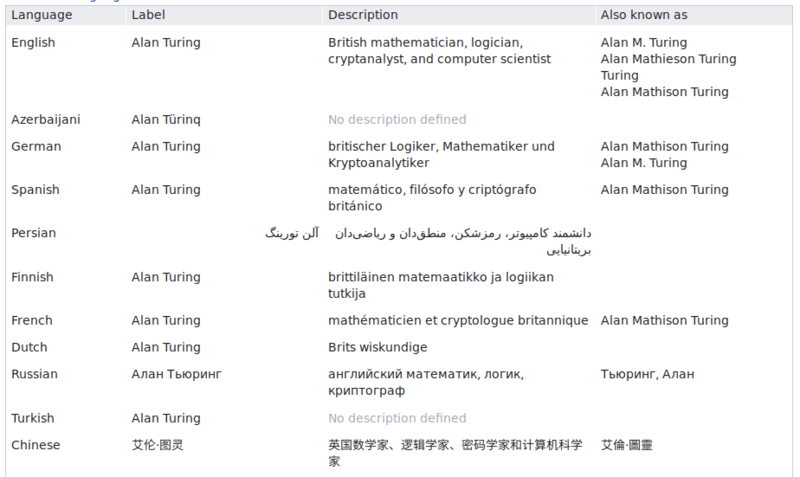 Most languages are left to right, so an RTL reader will see a lot of somewhat weirdly aligned languages. Even if they don't actually read them, it will look a bit off. These descriptions are comparable, but different from interlanguage links on mobile. At the moment each language is aligned according to its direction, and it doesn't look so nice to me. Article titles are usually short, so it shows a lot of strange empty space. 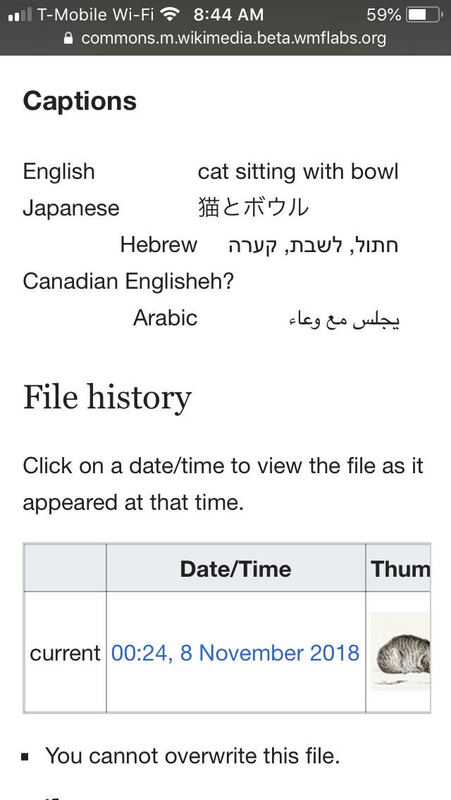 See https://en.m.wikipedia.org/wiki/Givatayim#/languages for an example. It used to be aligned to the same side, and I believe it was better. I really shouldn't decide alone, however—it's worth asking other users, both experienced and inexperienced. Yeah, the current behaviour is how we generally handle this situation in Wikimedia products. I think we should remain consistent with the wider practice rather than go it alone. Maybe a bigger-scale task for reviewing the behaviour in general? This is low priority for us now, so I'm fine with putting on the back burner. But I do think there's some room to find a design solution overall that looks better. This is the current situation on mobile and it just looks jarring at first glance. For the RTL languages on file captions for mobile only... one possible option would be to left-align the language label, and to right-align the caption, regardless of what language it is. The picture in the task description is really confusing. Label of language is the local name in some cases (like "español" instead of "Spanish") but for Hebrew is "Hebrew" and not "עברית"). As a person who speaks one RTL language (I mean I write it in RTL), it matters a lot. If the name being shown is local name, it should follow the directionality of the language (so "فارسی" for Persian should be RTL) but if it shows name of the language in language of the user UI (so "Persian" for Persian if the interface is set to English and "انگلیسی" for English when user interface is set to Persian), the it should follow the directionality of the user interface and not the language itself. The picture in the task description is really confusing. Label of language is the local name in some cases (like "español" instead of "Spanish") but for Hebrew is "Hebrew" and not "עברית"). Ignore that, it's from months ago where a bug meant sometimes the language was labelled in the interface language rather than the autonym. As a person who speaks one RTL language (I mean I write it in RTL), it matters a lot. If the name being shown is local name, it should follow the directionality of the language (so "فارسی" for Persian should be RTL) but if it shows name of the language in language of the user UI (so "Persian" for Persian if the interface is set to English and "انگلیسی" for English when user interface is set to Persian), the it should follow the directionality of the user interface and not the language itself. I really think you should make English words like "Hebrew" and "Arabic" and "Persian" LTR. Of course. But we should ever show the English version of a language name. Can you explain how / where you think we are? The language name is in English ("Persian" and not "فارسی") but it's RTL. This doesn't make any sense to me. I already filed T213241 and was told by @Ramsey-WMF it's duplicate of this task. I've re-titled this task to be what is actually the question (which, to repeat my view, is "yes").